Baked oatmeal is my favorite way to make oatmeal now. There is no standing at the stove stirring and stirring. It is more like mix all the ingredients into a big bowl; pour into a baking dish and let it bake. That means you can be doing something else while the oatmeal is baking. This recipe is peanut butter flavor forward, which make it not so sweet. It reminds me of a PB&J sandwich. Note: Make sure you purchase a peanut flour that is just peanuts and no added sugar or other ingredients. Combine all the ingrédients into a large bowl. Stir until well incorporated. Fold the berries into the oat mixture. Pour into an 8×8 baking dish. Bake for 40 minutes. 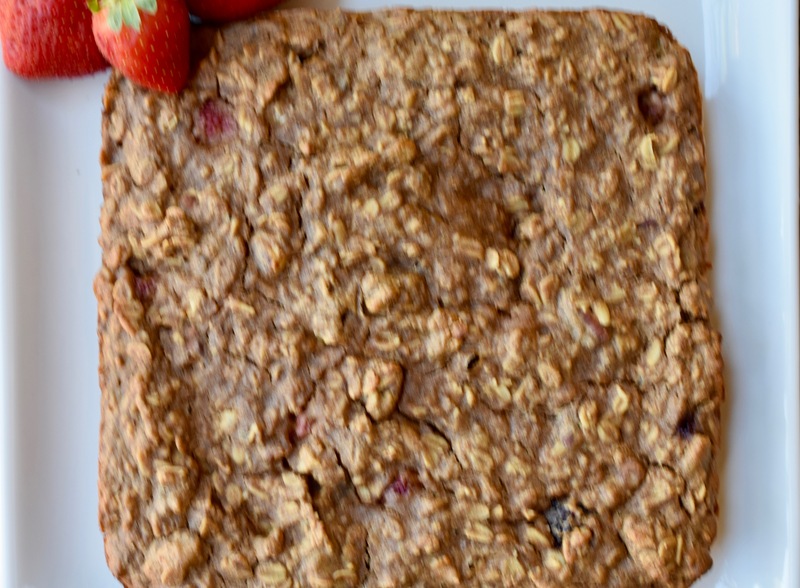 This baked oatmeal is more like a snack cake, so break out the forks. Yes, I too like baked oatmeal dishes. Great if you’ve got guests. Prepare the night before and pop in the oven in the morning. Hi Sheree. I love the easiness of it. Thanks for stopping by Cathryn’s Kitchen.